Defense Ministry refuses to make IDF soldier's home wheelchair-accessible due to technical issues with living beyond Green Line. Almost two years have passed since Operation Protective Edge in Gaza, but one soldier has still not been able to go home. Yitzhak Yehuda Yisre'eli was injured early in the operation, but remains in hospital despite making steps toward recovery. The problem: the Defense Ministry had refused to grant assistance to the family to outfit their home to fit Yisre'eli's needs without an official building permit - despite such a stipulation not applying to wounded soldiers living in Judea and Samaria (Shomron). 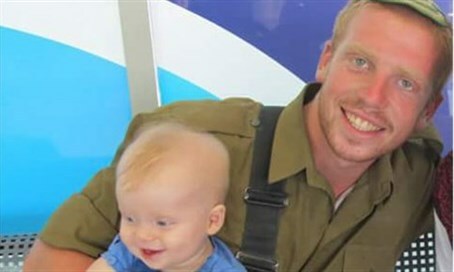 Yisre'eli, who served in the IDF's Givati Brigade, was wounded by shrapnel in Rafah, during the same firefight in which Hamas killed and abducted the body of Hadar Goldin. He is the last casualty from the war to remain in hospital, and was in rehabilitation for 18 months before he could even lift his head and give one-word answers. The family was only recently allowed to take him home for home visits, Channel 10 reports, but could not because it is wheelchair inaccessible. While the Defense Ministry granted assistance to the family to make the home wheelchair-friendly in theory, in practice the money was never produced due to the building permit technicality - a problem, as the family lives in Ofra, in the Binyamin Region of Samaria. The Defense Ministry responded Wednesday by saying that it "was not possible to consider the application at this time as long as there is no proper building permit," and that a hearing on the issue would be postponed until such a permit was granted.